Upper respiratory tract infection. 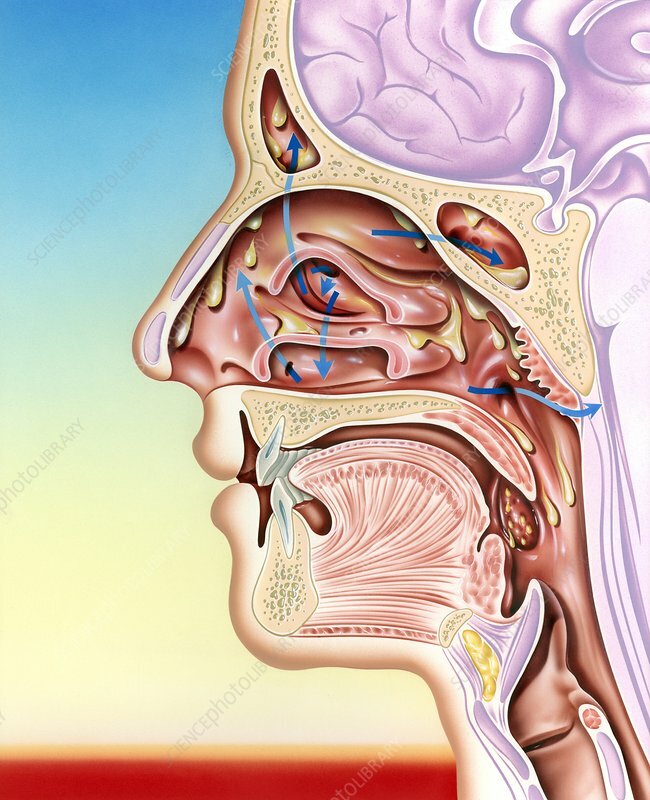 Artwork of a sectioned side view of the human face, showing the processes involved in an upper respiratory tract infection (URTI). These include the common cold, a sore throat due to tonsillitis, and a sore throat due to a viral infection. Mucus (brown) is seen accumulating and flowing down the sinuses, nasal cavity and the throat. Arrows (blue) show the openings of the sinuses and the nasolacrimal canal. The frontal sinus is at top (in the forehead). The sphenoid sinus is at upper right. The tonsils (lower right) are sets of lymphoid tissue at the back of the mouth in the throat.